HR P-28 | Hallberg Rassy sejlbåd bygget fra 1955 - 1973 i 536 stk. HR P-28 was constructed from fra 1955 - 1973, and a total of 536 boats were built. HR P-28 is built in many different versions. At the beginning, all hulls and superstructures were built in mahogany and had fractional rain. At the end of the 50’s it came fractionally rich and the design of the main window was improved to two individual windows. Already in 1963, the revolutionary GRP hull was introduced. At the same time the hull was made a bit wider. During an overlapping period from 1963 to 1966 there was a choice between wooden hull and GRP (fiberglass reinforced plastic) hull. In 1972 the rearview mirror was developed and added to her length from 8.61 m (28 ‘3’) to 9.04 m (29 ‘8 “). 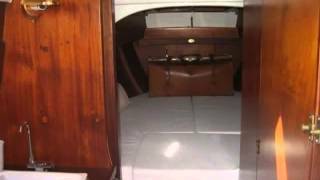 The boat was covered with teak as a standard from 1972, and the payroll was made in teak instead of mahogany. The largest markets for P 28 were the US and Sweden. Most of the first 100 boats were sold to the United States. P 28 is still a sought after model today. You are very welcome to discuss the HR P-28 below, and share your experinces with the rest of HR-Club. Please register at Disqus – is done very quick and easy! !